Scientists are calling out for help as they try to solve the mystery of 20 missing gold rings issued upon the death of an eccentric 19th century English philosopher, just before he was mummified and put on public display. Jeremy Bentham (1748 to 1832) was a philosophical and political legend. This famous English philosopher was a super liberal and political radical who helped establish the first police force in Britain, London's Thames River Police, in 1800. He influenced the beginnings of welfarism, advocated the separation of church and state, fought for equal rights for women, the abolition of slavery and the decriminalization of homosexuality. All things considered, we can forgive Bentham’s eccentric deathbed wishes - for a collection of 26 gold rings to be sent to a group of intellectuals, and that his body be surgically mummified and put on public display. The gold memorial rings each feature a profile of Bentham's head, his signature, and a lock of his hair. UCL has four of the 26 rings, including one that has not been inscribed, and the research team is calling on the public for help tracking them down. Among those intellectuals who received a ring were; military commander Marquis de Lafayette (1757 to 1834), a French aristocrat who fought in the Revolutionary War; the Guatemalan philosopher and politician José del Valle (1780 to 1834); and the editor and linguist Sarah Austin (1793 to 1867), whose husband, John Austin, was the first professor of jurisprudence at the University of London, according to the UCL website. Another famous man who received a ring was the utilitarian philosopher John Stuart Mill (1806 to 1873) and it was discovered by two UCL alumni in a jewelry shop in New Orleans. Another is owned by the descendants of Bentham’s servant, William Stockwell and the ring belonging to the French economist Jean-Baptiste Say was recently sold at Christie’s in London. 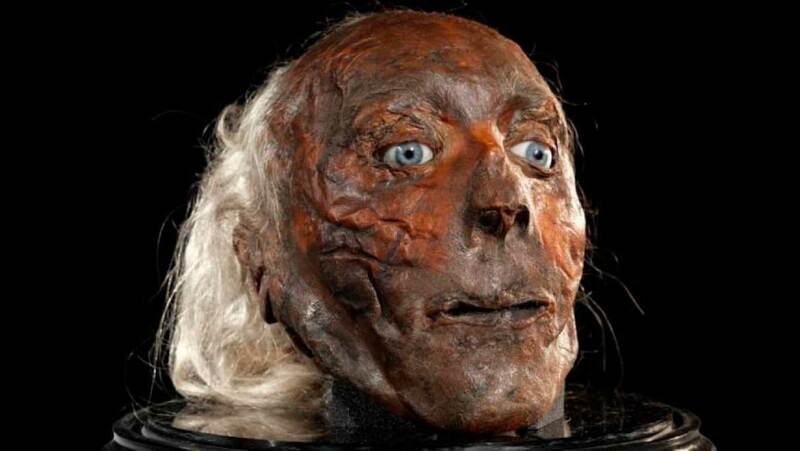 Unfortunately, Smith's experience in mummification was gained while reading the lore of indigenous New Zealand cultures and he placed Bentham's head under an air pump over sulfuric acid. While this successfully drew all the fluids, it completely dehydrated Bentham’s head leaving a dried leathery skin over the skull. To cover the mess-up the auto-icon was given a wax head with some of Bentham's own hair and his real head was locked away securely. 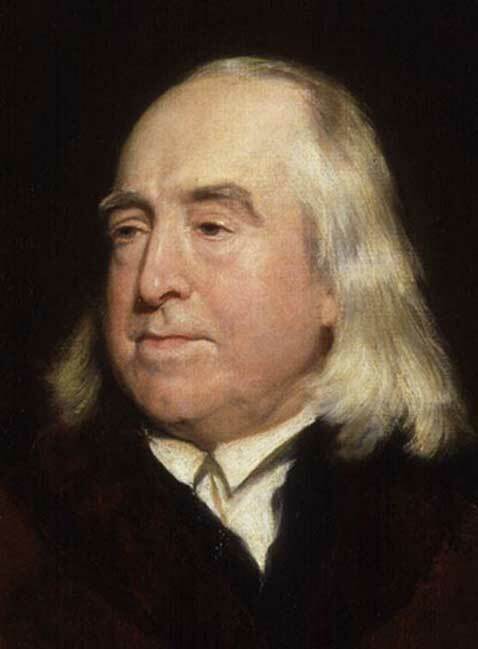 Was Bentham More than an Eccentric? More than 180 years after his death, Bentham’s head was brought out just last year in a brilliantly inventive bid to test his brain matter DNA for signs of autism. According to a report in the Daily Mail last year, in 2006 experts suggested specific traits of Bentham's “quirky” character resulted from his suffering Asperger’s syndrome, which is an autistic spectrum disorder. Among the clues scientists gathered to suspect he was a sufferer was his intelligence; it’s quite normal to find a raised IQ in Asperger's sufferers who characteristically struggle with social interaction and forging meaningful emotional connections to people and situations. Being unable to handle unpredictability is also another symptom of Asperger’s and, according to historian Charles Bahmueller, Bentham was deeply intolerant of uncertainty and unpredictability, with much of his work focused on “the banishment of chance and the consolidation of certainty.” He was also vocally suspicious of abstract terms such as 'intuition', which he labelled ‘fictitious entities.’ Results of Bentham’s DNA tests are yet to be published. If you have any knowledge regarding the whereabouts of any of the dispersed rings, University College London would love to hear from you.